Meet Garbino: the sleek, stylish, and award-winning waste can from Umbra. 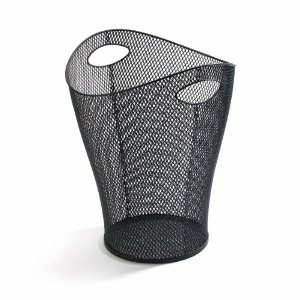 This powder-coated steel mesh version of the hip polypropylene can created by legendary industrial designer Karim Rashid bears the classic pleasing, curvaceous shape, integrated handles for easy emptying, and nesting capabilities for compact storage. Can measures 13-Inch tall by 10-Inch diameter and has a 2-1/2-gallon (9 L) capacity. Patented design by Karim Rashid for Umbra- the worldwide leader in casual, contemporary and affordable design for the home.